One of the biggest problems associated with raising captive-hatched tortoises is pyramiding. Pyramiding is the raising of scutes during active growth periods. 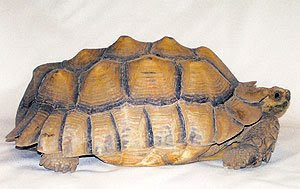 As a tortoise grows normally each scute increases in size horizontally thus increasing the overall diameter of each scute and the size of the tortoise. During normal growth this scute enlargement will lead to smooth growth. During periods of little or no growth (such as during brumation/hibernation) a slight ridge or ring will develop. This ridge is often referred to as a growth ring and in some species can help to establish how old the tortoise is. In a tortoise that is developing pyramiding, this new growth increases the size of the scute in a vertical direction thus raising the scutes. This is not a normal process of growth or shell development. It has rarely been documented in the wild. This phenomenon of itself doesn’t pose a problem for the tortoise unless dietary deficiencies are also present and have contributed to the pyramiding. 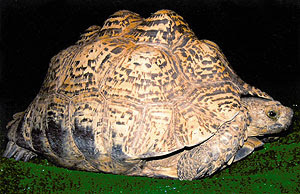 Extreme pyramiding in an otherwise healthy tortoise can lessen the ability of a male tortoise to mount the female thereby hindering reproduction. Scutes that have already exhibited pyramiding cannot be corrected; however, if conditions for shell development are corrected, the new growth can develop in a normal horizontal direction. It appears that the most critical time for pyramiding to develop is during the first year or two. If conditions are correct during the first year or two and pyramiding has not developed, then the chance of pyramiding developing in an older tortoise is greatly reduced even if husbandry conditions are not optimal. For years there have been a number of opinions on the actual cause of pyramiding. It had been pretty well assumed that excessive protein in the diet was the cause. Other factors including the ratio of calcium-to-phosphorus in the diet, temperature, access to natural light or UVB, dietary fiber and overfeeding were also cited as factors — most probably play a roll to one degree or another. As husbandry techniques were improved the problem of pyramiding didn’t go away. Tortoises, of course, became much more healthy, and their survival in captivity was greatly enhanced. And the very grotesque pyramiding that we use to see became rare, but the “perfect” captive-raised tortoise was also elusive and rare. As it became commonly accepted that protein was causing pyramiding, so to did the idea that protein should be all but eliminated from the diet. To compound the problem, two different methods for determining protein were compared and often assumed to be the same. One method of determining the percent of protein in a food item includes the water as a percentage of the food. The other method referred to as “dry matter” protein doesn’t include the water as part of the food. The results of the two methods are drastically different. By using the first method the percent of protein in dandelion greens is 2.7 percent. Using the “dry matter” method the same dandelion greens are 18.7 percent protein. I can compare this methodology of determining the percent of protein to adding a teaspoon of sugar to a glass of lemonade. Let’s say the sugar is 2 percent of the lemonade. Now, I’m concerned that I don’t want to consume a lot of sugar, so I add more water to my lemonade and thus reduce the percentage of sugar in my lemonade to 1 percent. I happily drink the lemonade falsely believing I just cut my sugar intake by 50 percent, but in reality I still got the full teaspoon of sugar. We must be careful and know if the percent of protein is the percent of protein only in the “dry matter” or if it includes water too. It is important to understand that protein is made up of amino acids, some of which are essential in the diet. As we begin to try and reduce the amount of protein in the diet, we must be very careful that we don’t eliminate the necessary amino acids. Over the years I have tried all kinds of diets only to become more confused when there were no consistent results in eliminating pyramiding. I understood that the diet was extremely important in raising a healthy tortoise, but it didn’t seem to have a whole lot of affect on reducing pyramiding. About five or six years ago, my wife decided to try a new method for rearing hatching tortoises. 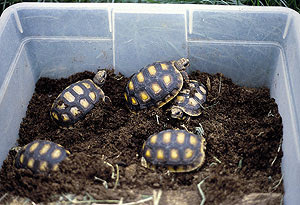 She set up two groups of new hatching red-foot tortoises for her experiment. The first group was set up in a plastic shoebox with dry paper towels (low humidity). The second group was set up in a plastic shoebox with moist paper towels (high humidity). The two groups were kept side by side and fed identically. Within a few months the difference was astounding. The tortoises in the dry setup had the typical pyramiding we see in captive-hatched tortoises. The second group had no pyramiding whatsoever and looked identical to wild-caught tortoises. We began to try increasing the humidity on several other species of tortoises with the same positive results. I theorized that hatching tortoises in the wild spend most of the time hidden in moist soil, clumps of moist grass or in the bottom of humid burrows. Even desert species spend much of their lives in the bottom of humid burrows. In January 2001 I presented my work at the International Turtle and Tortoise Symposium held in Vienna, Austria. I was excited to learn that many European tortoise breeders had come to the same conclusion and were beginning to raise hatchlings in an environment with more moisture. In 2003 the University of Veterinary Medicine in Vienna (Austria) finally quantified the importance of humidity in the environment of hatching tortoises, and also showed in their research that high levels of protein had little affect on pyramiding. The researches in Vienna theorized that during dry periods when food is scare there is little or no growth in hatching tortoises (pyramiding only develops during periods of growth). During periods when food is plentiful the humidity increases, growth is rapid and pyramiding rare. Other hobbyists in the United States have confirmed that increased humidity in their experiences plays a very important role in reducing pyramiding in hatchling tortoises. 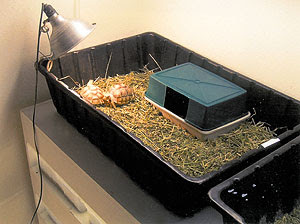 My next goal was to devise a convenient way to raise a tortoise at high humidity without creating problems associated with increased levels of bacteria, fungi and mold. I have experimented with a number of different systems and substrates and have settled on the following system. First, I’ve found that peat (sphagnum) moss works very well as a moisture-retaining substrate. It has a property that discourages the growth of molds and fungi. It also doesn’t seem to be toxic if ingested and doesn’t impact the gut if eaten. It is also readily available and relatively inexpensive. For years snake breeders and gecko breeders have used a “moisture chamber” for nesting and to maintain the health of their animals. I have taken the same approach with my hatchling tortoises. I provide a plastic shoebox with an entrance opening cut in the side. I put a 1- to 2-inch-deep layer of slightly moist peat moss inside the shoebox for the tortoises to hide in. The moist peat moss increases the humidity inside the box. The substrate outside the hidebox can be any commonly used dry substrate. I use dry alfalfa hay with all the thick stems and sticks removed. It is important to separate the dry substrate from the moist substrate in order to prevent the growth of mold or fungi on the dry substrate. It is also important to provide: water, heat, UVB lighting and a well-balanced diet. The peat moss should be checked routinely for moisture level and regularly replaced with fresh peat moss. After several years of using this system (moisture chamber), I have been able to consistently produce exceptionally nice captive-hatched tortoises. Under these conditions pyramiding can be eliminated, and my tortoises are active and healthy. I am sure that there are many other methods that could be employed to increase the moisture and humidity for our hatching tortoises. This is one approach that can be used in your husbandry techniques that has been successful for me. Wiesner, C. S. and Iben, C. 2003. “Influence of environmental humidity and dietary protein on pyramidal growth of carapaces in African spurred tortoises (Geochelone sulcata).” J Anim Physiol a Anim. Nutr. 87:66-74. Excelente blog. necesito información sobre ataques de perro; mi pobre tortuga lo sufrió y quiero sabe si me darán el tratmiento adecuado. A fantastic presentation. Very open and informative.You have beautifully presented your thought.